The most vulnerable areas on the body of the Jeep JK are the rocker panels. 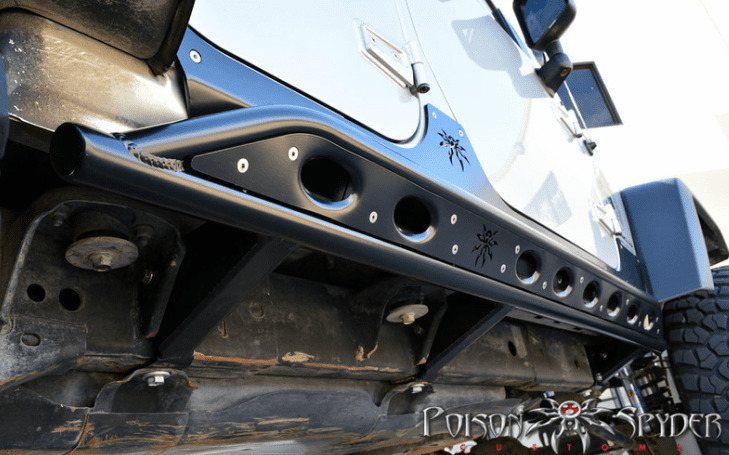 Poison Spyder Rocker Knockers protect your JK's rocker panel area while enabling you to slide over rocks and obstacles. Rocker Knockers enhance your Jeep's trail performance while adding rugged off-road looks to your JK. These Frame-Mounted Rocker Knockers are identical to our Body-Mounted version, except in how they mount. Which one is best for you will depend on how you intend to use your Jeep! DOM Tube Construction The tubular rocker rail is rugged 1.75" X .120 wall DOM structural tubing. The slider rail is fabricated from CNC-bent 1.5" X .120 wall DOM tubing. The space between the Slider and the main tube of the Rocker Knocker is filled with a 3/16" thick CNC laser-cut steel base plate for the removable slider skid. The slider and skid mount at an angle to the main tube of the Rocker Knocker to provide boatside-like protection from the rocks while keeping the Jeep's doors and body a safe distance from higher level trail hazards. Removable Slider Skid The removable slider skid features Poison Spyder's exclusive oval dimples for structural strength as well as great Poison Spyder looks. The Skid attaches with countersunk stainless steel flat head cap screws for a flush surface. The outer skid is made of 1/8" steel and is secured to a 3/16" base plate welded into the slider hoop assembly. The Slider does not rely on the skid for structure. The advantage of having the ability to remove the skid, is to allow you to replace it if it becomes damaged to a level that it has lost its aesthetic appearance or functionality. Also you will be able to customize the Slider's color to match your Jeep's body color, or any color you choose. Frame-Mounted Outriggers Frame-Mounted Rocker Knockers attach to your Jeep's frame rails through three rugged, precision engineered outriggers on each side. The outriggers are fabricated of CNC laser cut 3/16" thick plate steel, and are designed in a triangular shape to act as their own gusset and provide superior strength. The outrigger wraps around the bottom and side of the frame rail for support on two planes. The outriggers are also located so they may be directly bolted to the sides of the Jeep's body mounts for even more strength. Compare this design to competitors' frame-mounted sliders that use a simple piece of non-triangulated, non-gusseted tubing welded to a plate that attaches to the side of the Jeep's frame rail. Bolt-On or Weld-On installation Instructions and hardware are provided for a fairly easy bolt-on installation of the Frame-Mounted Rocker Knockers. The procedure uses some existing mounting holes on your Jeep's frame, but does require some additional drilling and tapping. Alternatively, installers may choose to weld the Rocker Knockers in place. Please note, however, that reaching the nuts on the back-side of the slider plate for installation of the removable skid will be more difficult with the Rocker Knockers already in place. We recommend testing the skid removal process with the Rocker Knockers bolted into place, before permanently welding them on. Suspension & Body Lift Compatibility Frame-Mounted JK Rocker Knockers are not compatible with typical "long arm" suspension kits, without some Do-It-Yourself modifications. The rearward support outrigger will likely interfere with the location of most long-arm kit's link brackets. The part number for this item is Poison Spyder 18-08-030 and it fits 2007-2016 Jeep Wrangler (4 Door Models).